We at Deckstainhelp.com offer tips for a plethora of projects besides deck staining. 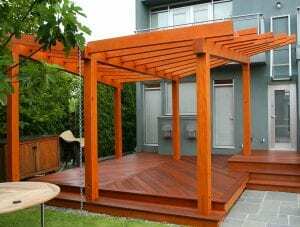 In this article, we offer our insight on how to best approach a pergola staining project when it comes to prep and stain application. We always appreciate your input, so feel free to leave a comment below with pictures of your pergola stain projects. A wood pergola can be a great way to reduce the amount of sunlight heating up your wood deck surface. It can offer shelter from the smoldering sun on extremely hot days without fully enclosing your deck. A pergola can also stand alone in a garden, over landscape features, over a hot tub and more. Like any exterior wood surface, a pergola should be protected with a wood stain to increase its appearance and lifespan. Knowing how to stain a wood pergola is key.